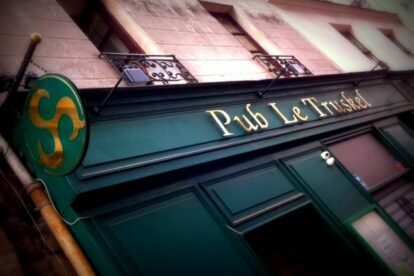 Le Truskel is the solution to the sometimes tricky problem of where to go in Paris after midnight. It is not difficult to find bars or clubs that are open late in the city, but with the night scene being rather scattered, it is worth taking the time to find a place that is both festive and wallet friendly. Le Truskel is one of the few venues that won’t try to transport you back to 1985 and charge you 10 Euros for a beer. The entrance is even free! I sometimes go to the Truskel at the end of a night out whilst at other times it will be because of what they have scheduled. Early in the evening live sport events are shown on big screen TVs, then as the crowds arrive DJs spark up mostly rock and indie tunes. Up and coming bands play regularly and touring bands often pop-in for surprise after concert acoustic sets or DJ slots. It’s a venue where you are never sure what you will see – or who you will meet!